The Cokin P Series Filter Holder is designed to accommodate multiple Cokin P Series Filters in order to help create the shot you envision. It can hold up to three rectangular filters, or two rectangular filters and one round filter such as a rotating circular polarizer, for the Cokin P Series Filter Holders. Rectangular Cokin P Series Filters are 84mm-wide and 1.6mm-thick. A Cokin P Series Filter Holder Adapter Ring can be used to connect this filter holder to the front of a lens. Box Dimensions (LxWxH) 7.402 x 5.118 x 0.866"
P Series Filter Holder is rated 4.3 out of 5 by 32. Rated 5 out of 5 by capegirl from Well made sturdy Rather than buy separate filters for all my lenses I decided to try the Cokin filter holder. It has three slots so you can easily stack filters. The adapter ring slides snugly into place(you must get a ring for each size lens). It is very well made and quite sturdy, I was somewhat skeptical at inexpensive price, but its perfect. Easy to use. Due to low cost I may just buy separate holder for all lens adapters so I can easily and quickly change lenses in the field rather than futz around with removing rings and filters, can just change lenses and slot in filters to new holder. I am very happy with my purchase. Rated 5 out of 5 by Getting ready for Africa from Simple and lightweight First you attach the Cokin adapter ring to the camera (separate items). Then you slide the Cokin filter holder onto the adapter ring. After that you can slide your filter(s) into one or more of the 4 slots on the Cokin filter holder. The Cokin filter holder is made of lightweight black plastic-like material that allows you to bend it slightly back so you can slip the holder on and off the adapter ring. Via the ring, the holder is firmly held onto your lens, but it can also rotate freely so that whatever filter you are using with it, say a graduated neutral density, can match a diagonal mountain horizon, if necessary. The filters slide freely up and down through it for proper placement, but I've never felt they could slip out. There is room for 4 filters in the holder. I haven't done that, and I imagine it might get tricky. It is a simple tool that does what it is supposed to do. Rated 4 out of 5 by Scott from Great filter system I've owned the Cokin system with my film cameras since they came out in the late 70s. I still have 8 filters and a few different size rings and I use it on my digital kit now. The only reason I had to buy a new holder is because my Joby strap came off and my camera fell to the ground. Luckily the filter holder took the whole brunt of the fall instead of my camera but it broke the holder. If you're looking for filters definitely consider Cokin as an alternative to Lee. Lee filters are great but will cost more in the long run and Cokin is just as good. There are a couple that I use all the time: polarizer, graduated ND and regular ND, and star pattern. I have others but only for special occasions. Rated 5 out of 5 by Slim Jim from Don't buy the cheap immitation I had previously tried to save some money by purchasing a cheap P Series Style Filter Holder. It did not accomodate the P Series Circular Polarizing filter because all the slots were the same size. The genuine Cokin P Series Filter holder has a wider first slot to accomodate the circular polarizing filter. This filter holder works perfectly. Rated 3 out of 5 by skywlkr from Use caution. The filter holder has a slot inside the 1st dedicated filter slot (nearest your lens) that one may try to slide their filter into. If you aren't very careful, the result will be a resin filter with a vicious scratch. I think this is a design flaw - the A series holder is made the same way. Otherwise, the holder works as advertised. Rated 4 out of 5 by Gary from Usable but fiddly The filter holder works well generally. The filters fit in easily but also stay in place once they are positioned. The holder is lightweight plastic and does not take up much room, though the filters and boxes they are in can be a bit bulky. The filter holder can be a bit fiddly to use, especially with the circular polarizer. It can be difficult to slide the polarizer out while the filter holder is attached to the lens, but having the polarizer in the holder makes the holder stiffer, making it more difficult to slide the holder off of the lens ring. The circular polarizer can also be a bit difficult to insert into the holder, and to rotate it in the holder. I also had some issues with using multiple filters simultaneously causing the camera's exposure metering and auto white balance to be less accurate than without the filters. But, overall, the product worked well and the various pieces fit together well. Rated 5 out of 5 by Rien from Fantastic Quality for Really Low Price Cokin Fitler Holder is total value for money and more. Its made of durable plastic, looks elegent and does not in anyway reflect its low cost. This is a MUST have filter holder for anyone using square/rectangular filters. I wish Cokin made filters that could match the quality of this holder. What's great about this filter holder is that you can use it for several other better branded / top quality filters. I was very fortunate to have bought what seemed like the very last piece in B&H stock ... coz I tried ordering 2 and the system wouldn't allow me ... so I also bought Cokin BPW400 Wide Angle Filter Holder for P Series. I don't think there is another product out there that can match the value of this filter holder. Rated 4 out of 5 by Black & Yellow from I would recommend this to a friend Comparing with a rotating ND filter with this one you have more space to adjust the intensity of ND by moving it up or down on your filter holder. I think it is easy to scratch it, cause is made of plastic, not glass. would you recommend the Z series if i am shooting under 24mm? You may use either the Cokin Z-PRO Filter Holder, or the Cokin BPW400 Wide Angle Filter Holder for P Series, B&amp;H # COWAFHP, for use with lenses wider than 24mm. Will these hold the 85mm Format-Hitech filters? just curious since i have the Format hitech filters. 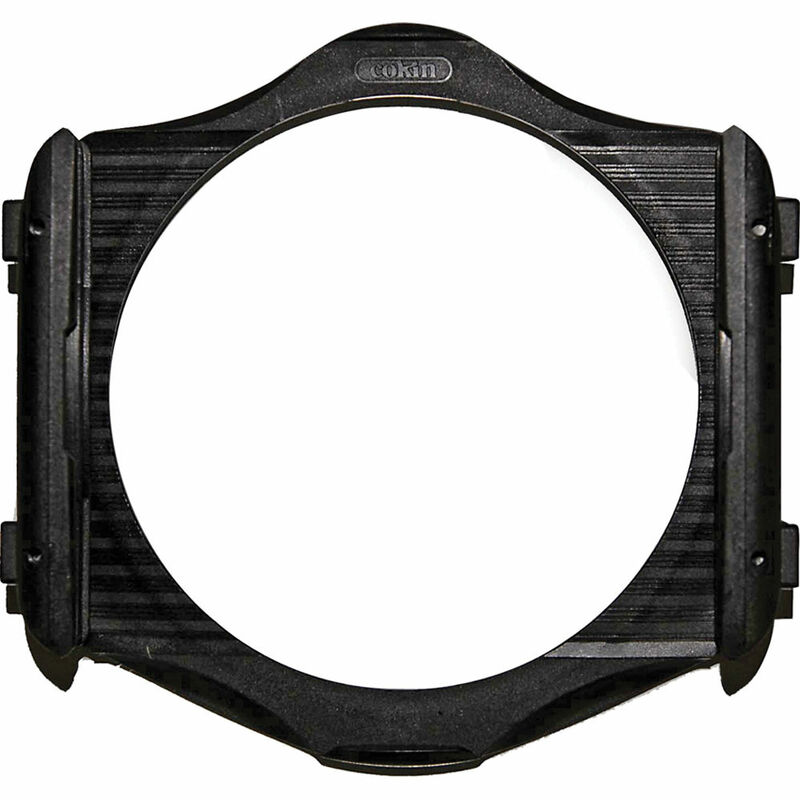 Yes this holder will work with the Formatt-Hitech 85mm filters which are the same size as the Cokin P filters. Does this work with the Lee 100 mm filters? It says in the description that it holds 85mm filters. Unless the Lee filter is 100mm x 85mm then I don't see how it can. how do I attach the holder to my camera? I have a 24mm lens that and uses a 52mm ring. Do I need an adapter ring to attach this cokin filter holder to my lens? This Cokin P series filter holder does not come with an adapter ring. You would need to purchase a 52mm adapter ring (B&amp;H# COARP52) to use this filter holder on a lens that has a 52mm filter thread. What is the largest lens filter thread size this can be adapted to? Try looking at the Cokin website (not allowed to put the link) Lots of info. I think that you will find the answer there. Answered by: RECHS ANN P.